A couple of years ago I stumbled upon American Saddlebred horses when I was on a research trip in Kentucky. I wanted to include horses into a book I was working on, and what better place than Kentucky to see some of the world's finest. My husband and I visited a number of race courses and working horse farms and were treated to some of the best Southern hospitality you can imagine. While most of the horses we saw were thoroughbreds whose livelihood is in the racing industry, we discovered the American Saddlebred horse in Shelby County, Kentucky, and visited a farm established in 1890. When we got an up close and personal look at a training session and a tour of grand house and grounds that make up the property, I knew I'd found the horse angle that I was looking for. 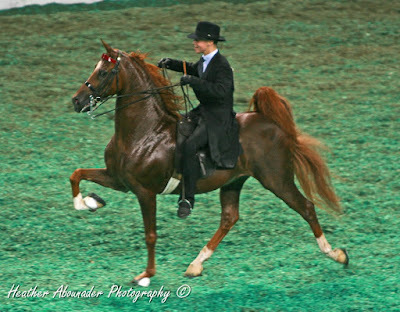 The American Saddlebred or Saddlebred for short is a uniquely American horse that has its roots in a number of breeds. The early settlers brought Galloway and Hobby horses, which were known for their ambling gait, to the new world which became known as the Narragnasett Pacer. Thoroughbreds brought to the colonies were bred to these horses and a bit later, the Canadian Pacer and Morgan horses were introduced into the bloodlines. This new breed was called the American Horse and the earliest known documentation of it was in 1776 when an American diplomat asked the Continental Congress to have one sent to Marie Antoinette in France as a gift. 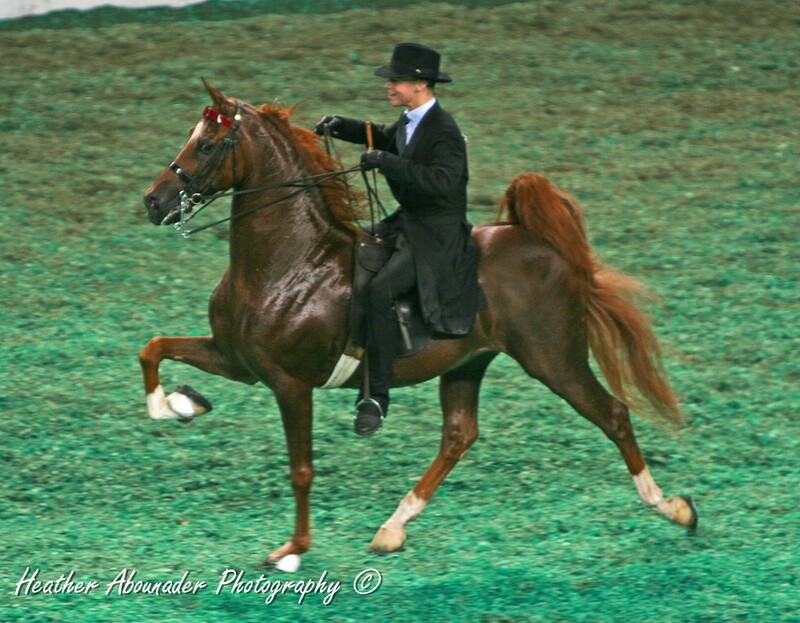 The Saddlebred is a magnificent animal known for its erect posture (head held high) and presence and showmanship in the ring, but also for its high-spirited, yet gentle temperament. No particular coloring is required to be registered, although bays and chestnuts are common. They have earned the moniker "peacock of the horse world" from their regal nature. During the Civil War, the Saddlebred horse was used exclusively as an officer's mount. While the breed was recognized from late in the 18th century, a breed registry wasn't formed until 1891. Since that time, the popularity of the Saddlebred has soared. Their primary purpose is as a show animal, but they're also used in some of the English riding disciplines and are a popular choice for pleasure riding. Show ring competitions are held throughout the US as well as in Great Britain and South Africa. 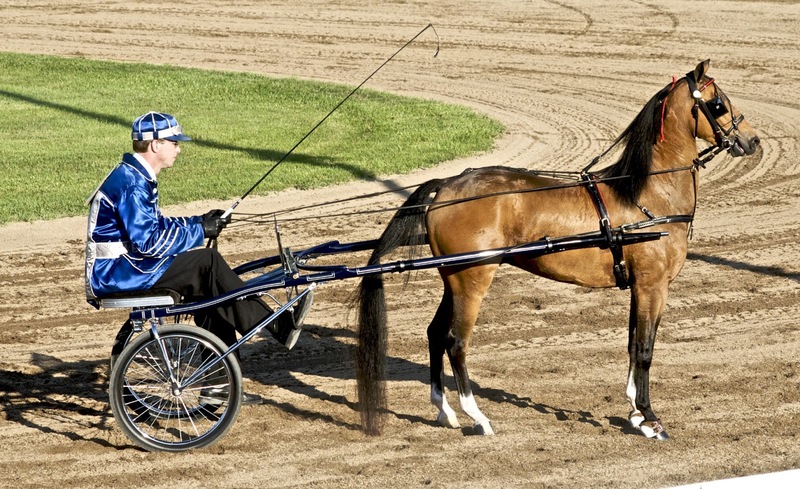 The horses are shown in classes which include cart pulling and pleasure riding as well as four-gait and five-gait competitions. The five-gait class is unique to the breed. 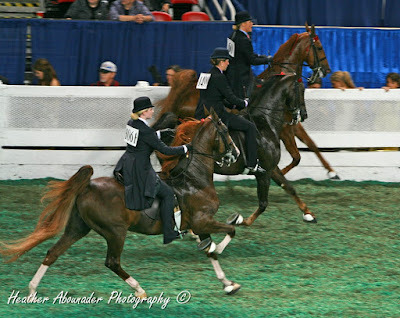 As well as running through the paces of the common gaits - the walk, trot, and canter - the five-gaited horse is taught two additional gaits that include a five-step pattern. Two versions of this are performed - the slow gait and the much faster "rack." While some horses require intensive training to achieve the five-gait, their breeding is such that some foals can perform the rack instinctively (rare, but can happen). Every fall the World Champion Saddlbred Five-Gait Competition is held at Churchill Downs in Louisville, Kentucky - an event that has become known as the "other" Kentucky Derby. Saddlebred owners make money by winning competitions and through their breeding stock. 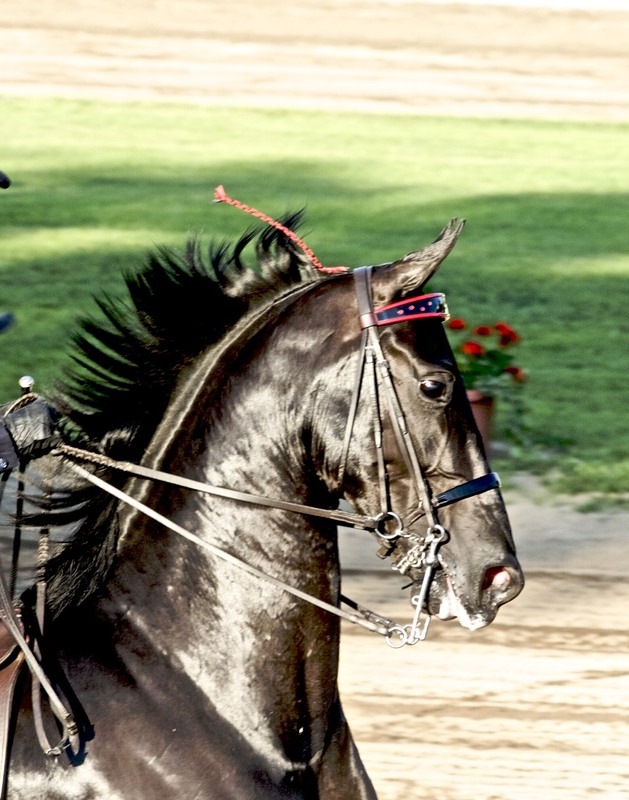 It's a fashionable sport that is expensive to participate in, but magnificent for horse lovers to watch, and Saddlebreds are no strangers to Hollywood. Roy Rogers horse Trigger was a Saddlebred as were the horses that appeared in My Friend Flicka, National Velvet, Fury, Giant, and other movies. Famous people who have owned Saddlebred horses are Clark Gable, Will Rogers, and William Shatner. Can you see why I had so much fun researching this topic? While my latest book A Flying Affair centers around the world of aviation in the 1920s, my heroine lives on a Saddlebred farm in Kentucky and has raised her beloved Gypsy since birth. I think I'm a little bit in love with Gypsy too. What about you? Do you like horses or ride them? Have you ever been to a horse show? Join the conversation and tell me about your experiences. I LOVE horses. I talked my parents into buying my first horse when I was ten. I owned three before I got older and my interest turned to other things. I look back at my experience with horses and am very grateful for them because I know it helps me when I write about horses today. I bet your trip was fun. Did you visit the KY Horse Park in Lexington? Your experience does shine through in your books, Vickie. I grew up around horses, but I didn't (don't) like to ride. They are beautiful animals, though, and I learned so much on this trip to KY. Yes, we went to the KY Horse Park, Keeneland, several stud farms, and Churchill Downs as well as the Saddlebred farm in Shelby County. Very fun trip in the beautiful blue grass country. Carla, I love these horses. Well, I love horses period. It's why I sometimes put more emphasis on the horses on my story ranches than I do cattle. I always daydreamed of being in a competition in the sport of dressage. We never had enough money for it, but it was still a dream. The horses you've pictured are beautiful, and the sulky racing is one I really enjoy watching. National Velvet and Black Beauty were two of my favorites about horses. Thanks for a great post. Can't wait to read your book! Beautiful animals! I can only imagine the fun you must have had visiting those horse farms, Carla--what a treat! I do miss being around horses. I had such a wonderful opportunity while we were living in Houston to volunteer at a therapeutic horseback riding center for several years. Some friends there got me started in dressage lessons, and I rode in my first and only schooling show. Owning my own horse has never been a realistic option, though, much to my lifelong disappointment. Carla, I love horses. Have 2 gaited horses. Tennessee Walkers and 2 Arabian horses. The gaited are for sure much more comfortable to ride, but those Arabs! They are much more people horses and much more loving. I was just out in the pasture visiting with the neighbor and my TWH came for the carrots and left but my Arabs stayed for an hour while we chatted. My Arab just kept rubbing his head on me and giving me attention. I find that during this trial in our lives with Joe's cancer that the most relaxing thing we can do is go out with our horses. Loved the post. Thanks for sharing! Oh, I do envy you, Debbie, with the Arabians. They are such beautiful horses. So glad you have them for this rough spot in your lives. Love you, sweet friend. Debbie - this is so precious. Yes, horses can be great listeners and good therapy for relaxing. You have been through so much! I first thought of using TWH in A FLYING AFFAIR, but I had my heart set on the Louisville setting which isn't TWH country with all the thoroughbreds and Saddlebreds. I don't have any experience with Arabians except that I think they are gorgeous. Hang in there, Deb. You're in my prayers. Thanks, Sharon, for sharing. Sometimes it's good to have a healthy amount of fear. I was thrown off a couple of times when I was growing up and quit riding. A nuzzle on the nose is about as close as I get now. Thank goodness, we're all made of different stuff and it's okay to admire from afar!